As posted on the Arabic edition (thanks Mike) and TUAW posted it as well. 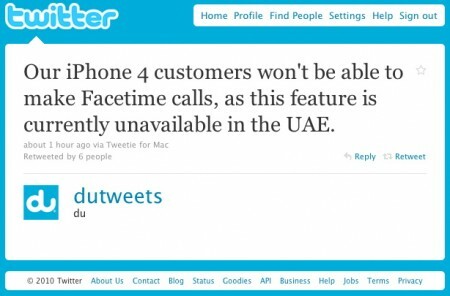 It has been confirmed: FaceTime will not work in the UAE! We have no confirmation if this was a decision by Apple, the carriers or the UAE TRA. why would Apple disable such important feature Â for users in certain countries? when we buy an iPhone 4, we pay for its full price with all advertised new features. If this is true that Apple has stopped this feature, Â then It is very irritating and unjustified action by Apple. The only logical reason as to why this is happening is that it will significantly reduce the demand on 3G video calls and conferencing. It rises a question of why they didn’t ban VoIP services such as Skype? Doing ever again exercise routines in relation to every day soles is definitely tremendously good together with cases gigantic procedure around the quick and as well coming.